Does SA itch? - We dare you! What about itching and scratching? Ever since Manuel’s first shedding he has been scratching himself during that period (of course that must itch). Then he hade a perfect coat which served as a perfect padding from his claws. The only thing was that he sometimes had a hard time reaching a spot – if so – the itching meant for that spot – always ended up on the top of his shoulder. (If so I always try help him locating the correct spot, giving him a nice massage there which he really likes). I learnt during those 6 years Manuel had no signs of SA, to really help him when he was shedding, by brushing him carefully very often. Manuel has areas with still perfect coat, but also areas without any under-coat at all. Imagine what happens when he scratches one full-coated area and the paw continues into the “un-padded” area – ouch! Here you see a picture of Manuel totally wet, which reveals the areas that are hardest affected. We went for a walk, and had no rain-coat. It was raining cats and dogs and we all became soaking wet – including Manuel. 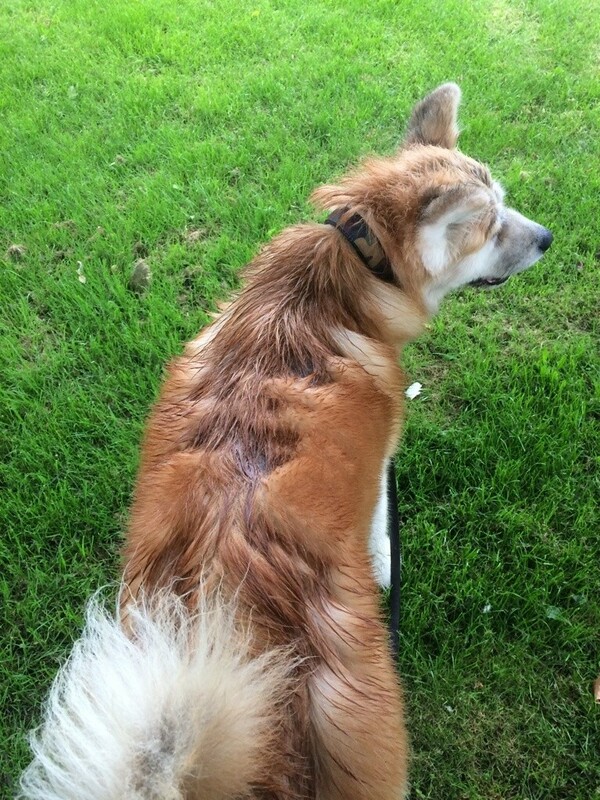 His “normal coat” was as functional as usual – two sets of “shaking the whole body” (close to his human of course ) and those areas were almost dry again. His “SA-areas” were soaking wet and I used a towel to make them as dry as possible. Some hours later, the skin is all dry and brittle and what is left of the coat is stiff and “glued” to the skin, creating a tough sticky surface that pulls the skin for every movement he makes – totally annoying to him! What to do? Obviously it hurts if a use a normal dog-brush or “rake”. I carefully slowly use a soft brush to separate the hairs from each other and from the skin and then I wanted to moisturize the brittle skin. I am not scared of hair falling of anymore, but if you pull the hair when wet/sticky – it actually ALL comes off even if then “OK” when dry – so don’t YOU be a WORSE hair-loss reason than the actual SA. So far we have been blessed from major bacterial infections (which also of course can be a major reason for itching). I hope and believe that is a are result of all the experience that has been shared with me by previous owners of SA-dogs, but it can also be pure luck – for now. 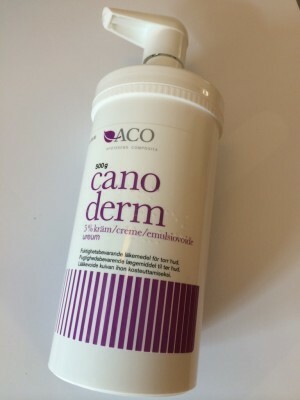 I bought an unperfumed skin lotion for humans at the pharmacy, created for very very sensitive skin where I chose carbamide as the active substance instead of glycerol (which more puts a protecting surface on top of the skin, I wanted something that really the skin absorbs). Previously I found a great cream but it was just too thick to apply on a “furry friend”. This one works much better. I did it yesterday, and no negative reaction at all, neither from the skin, nor from Manuel. He felt comfortable immediately and has not scratched at all since I applied it. And I forgot the major reason for itching – dry skin (after x amount of SA attacks, the amount af Sebaceous glands are reduced, and X amount of hair follicles dead (fur is usually protecting the skin). How are you? How is Manuel?We hope that everything is ok.
We are from Austria and our Akita inu dog Akakuma is allergical on allmost all kind of meat.We feed him with reindeer now.We search since long time for some treats from the same meat.In Austria ist not posible to get. Please help us with an adresse from Sweden wehre we may find meat or bones for dogs.We search in internet but we do not find any wich may sale autside Sweden. We thank you and all the best wishes for you and Manuel . Hello Tamara. Manuel is “ok” right now – the SA is not more than before but he is shedding so when he wants to scratch a shedding spot, he slips into a “non- under-coat-area” and hurt the skin. Regarding Akakume. I am sad to hear about the heavy allergy. So I guess you already feed him with fresh food only? I figure you already have done that too. * Treats from reindeer – correct? I believe there are people here from other countries that might be able to help you too!! Now I do not know if Akakuma is allergic to more (pollen, mite) but for a couple of Akitas I know here who ARE, they also have more sensitive stomachs during the heavy pollen-periods (just like I react, as I am allergic too). I think that SA do not itch, Akakuma never scrach himself, but may be is dieferent from one dog to the other.He have so many allergies and he never scrach.He is just in verry bad mude when start an SA Attacke he is showing us that he do not feel well. We think that the SA is not just a skin problem. He start to show that he is not ok Long before he start with the Skin problems. We search everything everything it was ok: blood,heart,bones, nothing cood tell us why Akakuma so quiet, sleeping all the day, he do not play with our other dog Maya. Now we know it was SA. No it does not seem it scratches primary on Manuel eihter. By the way. Many times with SA, many times allergies comes too. Also I have learnt that thyroid gland issues usually also occurs. That can be one of the reasons for the mood change…maybe you could check that next time you are for a check-up at your veterinairan. But of course you are right, also “only” the SA-attack can be the reason. Honestly Tamara – I am not a veterinairan, BUT I strongly RECOMMEND you to start using fresh food (frozen fresh, you do not need to BARF control by yourself). I can not promise, but ALMOST promise he will ACCEPT OTHER PROTEIN when it is “real meat”. Food allergy is not that COMMON at all. The surveys show that. The so called “allergy-dry-food” is all “strange” and not natural for a dog. I have been a part of TWO Akitas with Atopic Dermatitis and both had to go test all kinds of “dry food” with no good result. I recommend you try Frosen, fresh food. Room temperature, and already mixed. For example Finnish MUSCH where they have already mixed meals, where you alter the menu – which an Akita usually really likes. We Check the thyroid everything is ok.Bad mood is that he is sleeping all the day.He dont want even to go walking. I wish you a good Night! So I sent you an e-mail with what I found in Sweden. I believe there is more to find in Norway and Finland. How are you and Manuel? In between we found a reindeer frozen Food in Germany.Is a reindeer meat pure.I dry the meat myself.Aki and Maya are very happy with this treats.